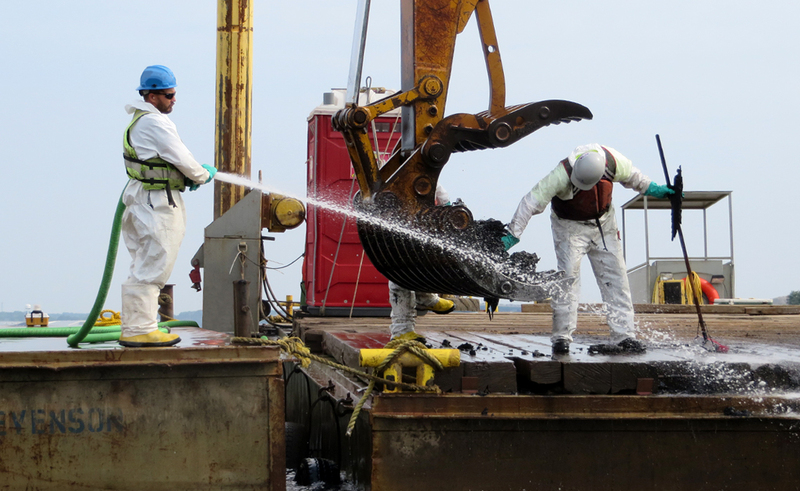 In-water removal of 6,100 tons of debris prior to initiating dredging activities. Setup, operation, and maintenance of a 2,500 GPM wastewater treatment plant to treat filtrate. Hydraulic dredging to Geotubes® of an estimated 26,500 CY for dewatering of silts and sands. Mechanical dredging of 6,700 CY of near shore sediments. Excavation within a tidal marsh of an estimated 30,500 CY of soils. 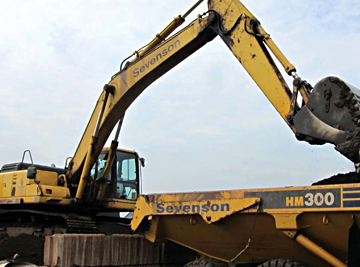 Transport and disposal of 83,000 tons of dewatered sediment and debris. 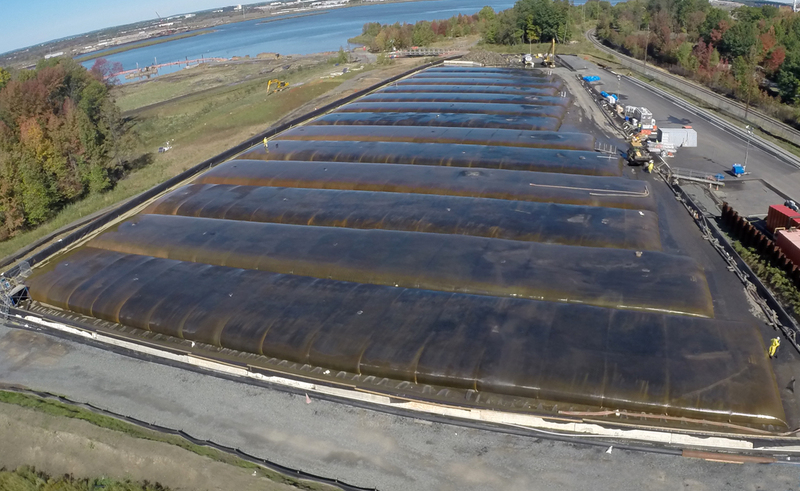 Marsh restoration and backfilling using an estimated 33,000 CY of clean, imported fill. Wetland planting of nine acres with native species. 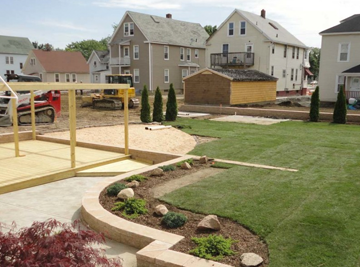 Site preparation activities included clearing and grubbing to gain access to the waterfront area, as well as transferring soil and sediment from the nearshore excavation zones to the containment pad. Additionally, a temporary bridge was constructed over a sensitive pipeline area along the access/egress road. 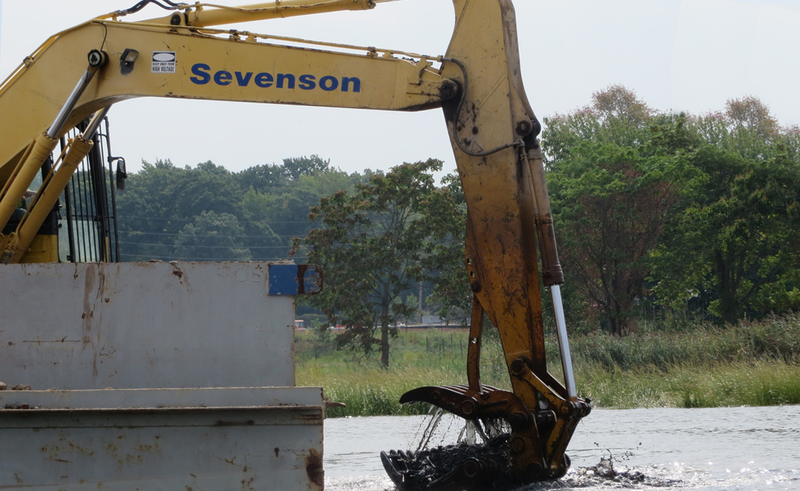 Before commencing hydraulic dredging activities, Sevenson used a barge-mounted excavator, equipped with a rake attachment, to remove debris. Debris was loaded into scows and pushed to a dock adjacent to shore, where it was then offloaded and sized for final disposal. 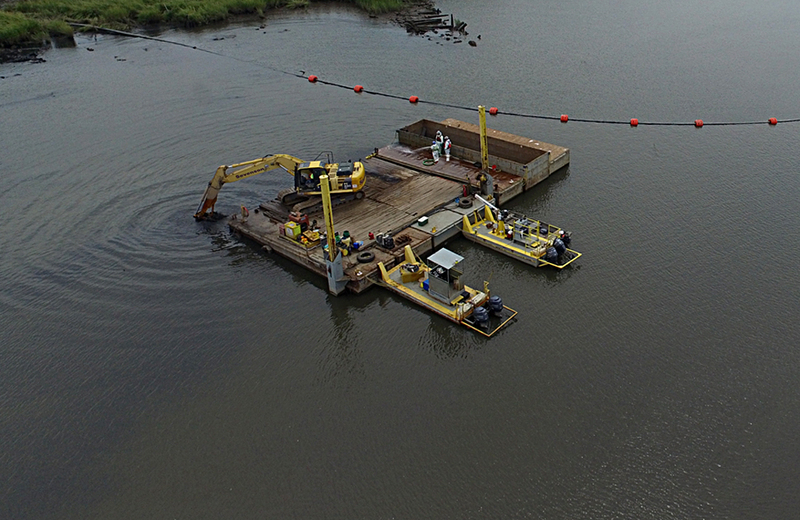 A VMI 10-inch horizontal auger hydraulic dredge pumped sediments 2,000 LF from the Raritan River to the dewatering pad. Due to a five-foot tidal fluctuation and two- to four-foot/second river velocities, Sevenson installed a silt curtain, anchored to pilings, around the dredge area. Sevenson installed, operated, and maintained a 2,500-gpm system to treat and filter all waste water from dewatering operations. The system consisted of a mixing tank that is supplied with ferrous iron and agitated with air; coagulant feed system; flash mixer; polymer feed system; a tank designated for blending flocculants; inclined plate clarifier; clarifier effluent tank; and sand filtration. 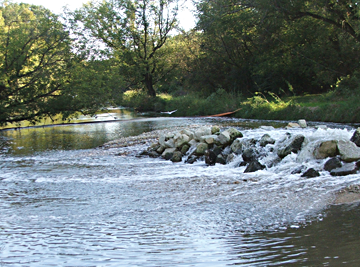 Sevenson tested the wastewater at established intervals and, upon determining that samples met the specified treatment criteria, discharged the treated water back into the creek (adjacent to the site), which flowed back to the river. 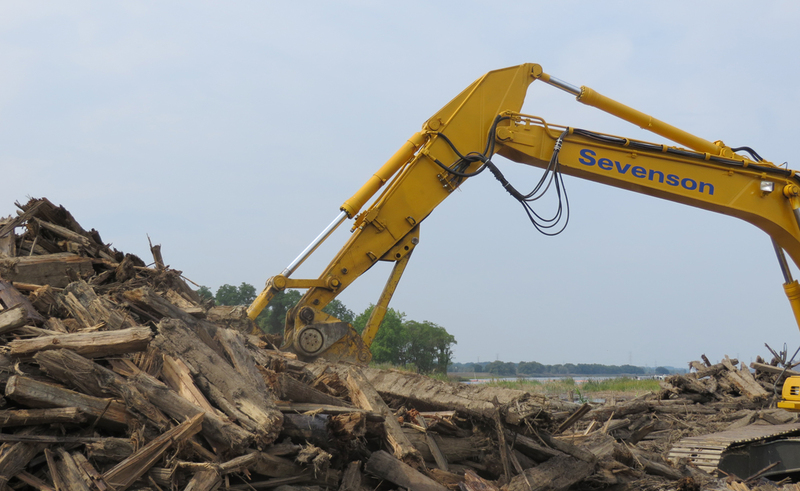 Sevenson mechanically excavated nearshore and impacted marsh plain soil and sediment using a long-front excavator and a network of low-ground pressure trucks staged on wood roadway mats. Mechanically excavated material was transported to the containment pad for blending with a reagent, which reduced the material’s water content and stabilized it for transportation. Material was then loaded out to railcars for offsite disposal. Additionally, Sevenson reconstructed and upgraded other structural components of the rail spur. 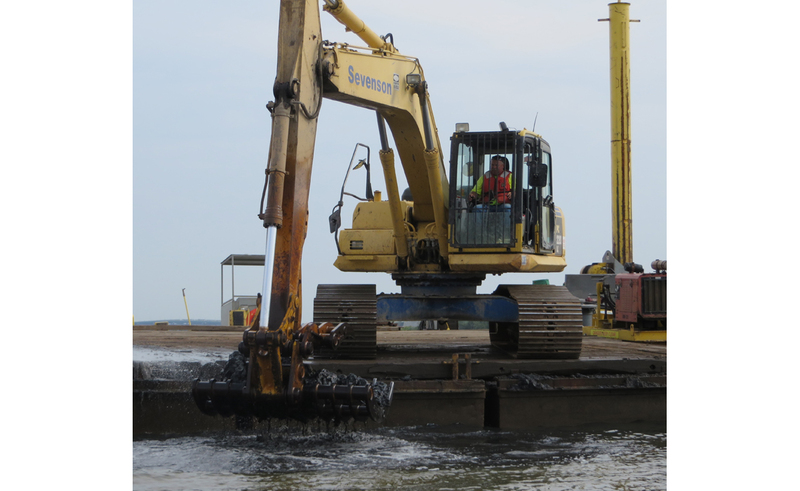 Upon completing dredging in the offshore river area, Sevenson installed a sand cap and placed clean sand fill in the marsh and nearshore areas. The marsh areas were revegetated with native plant species, and drainage channels were improved to support a healthier marsh environment.